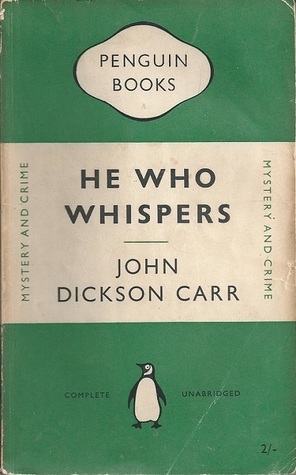 He Who Whispers by John Dickson Carr was my Classics Club Spin book for August. It was first published in 1946. Carr (1906 – 1977) was an American writer who also wrote under the pseudonym of Carter Dickson and Carr Dickson. In 1936 he was elected to the Detection Club in London. He Who Whispers is one of his ‘locked room’ mysteries/impossible crimes, featuring Dr Gideon Fell, an amateur sleuth. I really didn’t know what to expect so I was pleased to find that I thoroughly enjoyed this book. It’s well written, set in 1945 just after the end of the Second World War when Miles Hammond is finding it hard to getting used to peacetime. London is still showing the scars of the war and he feels that his life is unreal. He has been discharged from the Army after being in hospital suffering from diesel-oil poisoning. Then, gasping out to the end like a gauleiter swallowing poison, the war is over. You come out of hospital – a little shakily, your discharge papers in your pocket – into a London still pinched by shortages; a London of long queues, erratic buses, dry pubs; a London where they turn on the street-lights and immediately turn them off again to save fuel; but a place free at last from the intolerable weight of threats. His friend, Dr Gideon Fell, has invited him to dinner as a guest at the Murder Club, their first meeting in five years, where the speaker is Professor Rigaud. But when he arrives he finds none of the members of the Club have turned up. The only other people there are the Professor, and a beautiful blonde called Barbara Morell. Rigaud, however, tells them the story he had prepared for the Club – a tale of an impossible murder on the top of a ruined tower, that had once been part of a French chateau burnt down by the Hugeunots in the 16th century, and a mysterious woman, Miss Fay Seton. The body of Howard Brooke was found lying on the parapet of the tower by two children between 10 minutes to 4 and 5 minutes past 4. He had been stabbed through his body with a sword-stick and yet the evidence showed conclusively that during this time not a living soul came near him. Rigaud points out the difficulties of scaling the wall of the tower, leading Miles to suspect he is alluding to ‘some sort of supernatural being that could float in the air‘ – in other words, a vampire. Now, six years later Miles, Rigaud and Barbara together with Dr Fell set about trying to solve the mystery. I was fascinated by Dr Fell, supposedly based upon G. K. Chesterton (author of the Father Brown stories), in his appearance and personality. He’s immensely tall and fat, with a big mop of grey-streaked hair, and wearing a long, dark cape. He strides along ‘with a rolling motion like an emperor, and the sound of his throat-clearing preceded him like a war-cry‘. I thought the characterisation was excellent and there is a great sense of location. The book is full of tension and there is a real sense of approaching danger and disaster as the characters struggle to uncover the truth. It is only due to Dr Fell’s ingenuity that their fears are calmed and he produces a rational explanation and reveals the truth. I too was puzzled and the book had kept me guessing right to the end. Even then when I knew what had happened I was so involved with the characters that I was left wondering – what happened next? Now, I’m keen to read more of John Dickson Carr’s books. There are a lot of them – see the list at Fantastic Fiction. So glad to hear you enjoyed this one, Margaret. I’ve always thought Carr was good at evoking atmosphere. And, of course, he did create some memorable mysteries, didn’t he? I hope you’ll enjoy exploring more of his work. I’ve been reading some older mysteries lately, but I don’t think I’ve tried Carr. Maybe I will. Carr is a pretty new discovery for me, too. I read The Case of The Constant Suicides last year & thought it was great. I enjoy his books too although I don’t often find them in secondhand bookshops. Carr is a wonderful wonderful author and wrote close to 80 novels so there is a lot to choose from. I would highly recommend Till Death Do Us Part, The Judas Window and The Problem of the Green Capsule as others from his oeuvre to search out!